Emma Bland Smith is a librarian and writer living with her family in San Francisco. This is her first book for children. She has written a nonfiction book for adults, San Francisco’s Glen Park and Diamond Heights (Arcadia), has contributed to Sunset and other magazines, and writes for the family website Red Tricycle. Winner of the 2017 Cook Prize for best picture book teaching STEM principles to third and fourth graders! Finalist for the Washington State Book Award! "This accessible and engaging picture book is an empowering account of a conservation success story." "James’ realistic, finely detailed paintings glory in every hair of the wolves’ fur...environmental good news invitingly presented." "The book aims to raise awareness about wolves, and a feeling of connection with their survival." "In sharing the book with groups of readers, Smith said she is struck by how they react once they 'make the connection that Journey is real.'" 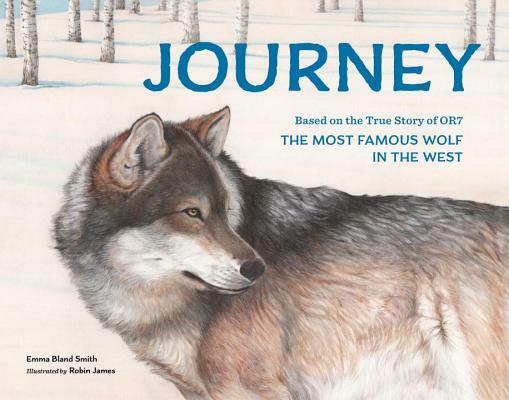 "A young girl follows the wolf’s journey and, along the way, learns about issues around the re-introduction of wolves. It’s an opportunity to engage young readers beyond the story."